Many people tend to be skeptical when it comes to the in-exact and intuitive sciences like Astrology, Numerology, Tarot and others. This is understandable, after all, we live in a world that is practical, logical, and straightforward -- to some extent, anyway. Skeptics think that the notion that your name reflects your personality, or that your date of birth foretells things about your future, is farfetched, if not completely ludicrous. And unless you are the inquisitive type, you will probably accept this as final and move on, comfortable in the knowledge that you, at least, will not be fooled by any of those metaphysical sciences. And yet, if you take the time to look a little deeper, you may be surprised at how flawed and limiting that perception is. In fact, if you stick only to accepting that which can be proven, touched, seen with your own eyes, you stand little chance of surviving for long in this not-so-practical world. I am sure that even the most skeptical person has experienced "mysterious phenomena" in his or her life, and responded to it without hesitation. They just don't call it mysterious or consider the implications. After all, it's safer to stay away from that. For example, how many times have you "felt" that someone was staring at you and sure enough, when you turn around, so-and-so is looking right at you. What kind of explanation would you apply to something like that? After all, there was no visible or material connection of any kind between you and the person staring at you from twenty feet away. So how did the message travel across space and alert your brain? I can tell you that in my life I have seen a number of instances where this kind of instinct saved me or someone else from disaster. Just as I have seen people who appeared too dense to pick up those kind of subtle signals walk into bad situations that could have been avoided, had they been a little bit more sensitive to their instincts. To many skeptical people, though, instinct is acceptable. The animal kingdom thrives on it and people recognize that. But what is intuition if not an evolved, sophisticated form of instinct? Absorbing and accepting information without going through a rational thought process is common, we do it all the time. The truth is, there is no real separation between what we consider real, practical or material, and that which we refer to as intuitive. The world of matter is real, or so it seems, but that's debatable, considering that every second reality changes in a trillion small and not so small ways. It's more accurate to view it as a kind of constantly metamorphosing organic illusion that never stays the same for a single nanosecond. Picture the whole cosmos as a beautiful animation, with sound and light effects, reshaping, transforming, turning and tumbling like one of those old light shows they used to play during rock concerts in the sixties. Perhaps this sounds a bit like someone who sucked on one too many sugar cubes. But if you were able to see this down-to-earth, so-called stable and orderly reality from a far enough perspective, with a frame speed set so high a million years fly by in about a minute, you would recognize the lunacy of thinking of your material world as anything other than the ultimate illusion. And that's where you live, in a volatile, constantly changing, unstable environment. And yet, as a product of this creation, you are actually a pretty cool and superbly adjusted piece of work. You have a brain that not only can string thoughts together in a more or less logical way, but also draw conclusions and take action -- your brain picks up signals you can't even see. Not to mention all the amazing things it can do that you learned about in biology class; the way your eyeballs deliver instant images to your brain, for example. Or your ears, another piece of fantastic equipment. Your nose, your fingers, your tongue -- when we applaud scientists for putting together a cool robot and flying it to Mars, who are we kidding? Compared to the totality of this creation, that's about as sophisticated as a toenail. What a world, non? And how do we share all of this with each other? With symbols, of course. Symbols in the form of numbers, letters, words, objects, signs, images, etc. We communicate with symbols, not only to each other, but also to ourselves. When that scientist is working on his fancy little robot, he is manipulating information in his brain with the help of symbols, in the hope that something clicks. But there was a time when we didn't have symbols. When we were dumber than a stick and took centuries to discover fire. We didn't communicate much at all. Imagine yourself a Neanderthal a million years ago, plodding through five feet of snow and carrying a heavy club. You are hunting deer or something else to kill and eat. Suddenly, you see this other dude, club in hand, coming towards you. You don't know this guy, so you start by making threatening noises, perhaps shaking your club to show that yours is bigger than his. The sounds you make are unpleasant and scary. The stranger realizes you are not someone to mess with, so he turns and runs off. Good for you. But a little further on, you see this nice looking female Neanderthal, also armed with a big stick, and just like you and the guy you just chased off, looking for food. Another competitor, but now you respond very differently. You make cooing, smoochy sounds. You try to make her feel safe so you can lure her to your cave. Different sounds, different message. Now fast forward a million years, and those sounds have evolved into words, but still reflect their meaning in a way not usually acknowledged. For example, you hated the guy you encountered because he threatened you and you had no use for him. But you loved the female and she got your "love," a word that sounds and feels warm, like an embrace. Go ahead, speak it and you can sense the comfortable and protective feeling of the word "love." It's a pleasant sound, cozy and homey, like so many nouns and verbs that have an "o" as their first vowel. The guy, however, got a sense of your "hate," a word that feels like a bite; aggressive and confrontational, ambitious and angry. Go on, say it like you mean it and you will recognize how unpleasant that word sounds. And while you're at it, notice how often the letter "a" shows up as the first vowel here? Just as in words like "war" and "battle," "taunting," "challenging," "taking" and so many others. Of course not all words with "a" as the first vowel are unpleasant, and not all words with "o" as their first vowel are positive, because just like humans, letters and numbers have many sides to their personalities. Still, every letter in every word in any particular language reflects the intuitive sense of its meaning as fitting the people who speak it. For example, the letter "e" is the most common vowel in the English language and represents freedom, expansion, energy -- look at all those "e"s -- which pretty much reflects their first priority. Latin languages, on the other hand, have the "a" as the most common vowel, echoing the fact that individualism is their most obvious attribute. All of this reflects the synchronicity between humans evolving, and the symbols they create in the process. Which brings me to the third capitalized word in the title of this article: Numerology. The art of recognizing the relationship between symbols (numbers and letters, names and dates), and what they represent. 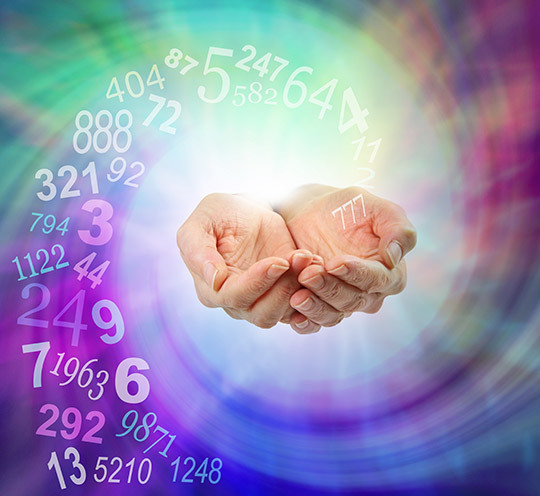 It's an intuitive science, of course, and as a Numerologist, I am trained to find those connections between your name and what it says about your personality. Or your date of birth and what it tells about your future. So that's it in a nutshell. Symbolism reflects synchronicity, and Numerology is the study of the patterns and connectivity that exists between the two. Symbolism, synchronicity, mysteries, physics, even psychology, are like fingers scratching the surface of the unknown. Well would you look at that! Could it be a coincidence that every one of the five words used in the previous paragraph have the scholarly, spiritual "y" as their first vowel? Not really, after all each of them reflects some aspect of the unseen, subtle, hidden, and underlying reality of nature, and the one letter in the alphabet most specifically associated with looking for the hidden reality, is shaped like a pair of arms reaching for the sky. I don't know about you, but this kind of thing gets me all hyped -- oops, another "y" vowel. I have got to stop looking for these kind of connections. It messes with my ps"y"che!